Washington Post correspondent Jason Rezaian has been convicted by a Revolutionary Court in Iran, according to state-run media. Rezaian was reportedly facing up to 20 years, but the sentence was not specified on Monday. He has already been behind bars for more than a year. Rezaian was taken into custody in July 2014 and later charged with espionage. The Post has denied all the claims against him. On Monday, the newspaper's executive editor Marty Baron said the "guilty verdict" announcement "represents an outrageous injustice." "We are working with Jason's family and Iranian counsel to pursue an immediate appeal, and we expect Jason's lawyer, Leila Ahsan, also to petition for Jason to be released on bail pending a final resolution of the case," Baron said. Iran's detention of Rezaian has been widely condemned. Analysts say he has been treated like a pawn amid internal political battles and geopolitical disputes between Iran, the United States and other world powers. Last month, Iranian President Hassan Rouhani, in an interview with CNN's Christiane Amanpour, raised the prospect of a prisoner swap. "If the Americans take the appropriate steps and set them free," Rouhani said, referring to Iranians who are being held in the United States, "certainly the right environment will be open and the right circumstances will be created for us to do everything within our power and our purview to bring about the swiftest freedom for the Americans held in Iran as well." Rezaian's trial, which the Post denounced as a sham, started in May and ended in August. Weeks came and went without any word about a verdict. Then on Sunday an Iranian judiciary spokesman, Gholam-Hossein Mohseni Ejei, said a ruling had been handed down but that he didn't know what it contained. 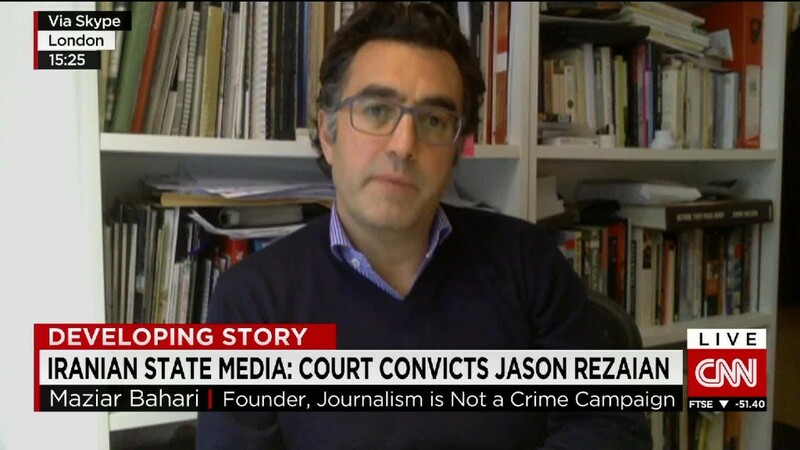 Mohseni Ejei said the ruling may be appealed by Rezaian or his lawyer within 20 days. Doug Jehl, the Post's foreign editor, said the puzzling, secretive situation "suggests once again that Jason is not really a prisoner, he's a bargaining chip being used by the Iranian government to extract some concessions from the U.S."
Rezaian holds dual Iranian and American citizenship. On Sunday the U.S. State Department reiterated its call "for all charges against Jason to be dropped and for him to be immediately released." The Obama administration has drawn mounting criticism for its handling of the case. Some Republican candidates for president have called Rezaian and the two other Americans held in Iran "hostages." Administration officials and Post editors have not gone that far. But last Friday the newspaper noted that Rezaian had been detained for 444 days -- "the same amount of time as U.S. government employees during the Iran hostage crisis of 1979-1981." The Post called this "a milestone significant in its injustice." Ahead of Monday's conviction announcement, Rezaian's family members had been bracing for a guilty verdict. They considered it likely, given what they called an "unconscionable pattern by Iranian authorities of silence, obfuscation, delay and a total lack of adherence to international law, as well as Iranian law." On Monday, Ali Rezaian, Jason's brother, said the family has already gone to court "to seek clarification" of the verdict. "In just the latest cruel step in the outrageous legal process ... they were provided no further information under the guise of a translator not being available," Ali Rezaian said in a statement. "Today's events are just the latest in what has long been a travesty of justice and an ongoing nightmare for Jason and our family." Speaking with CNN's Wolf Blitzer on Monday afternoon, Ali said his brother learned of the verdict by watching Iranian TV. Rezaian's ordeal began last July when he and his wife, Yeganeh Salehi, were taken into custody. She was later released. But the threat of prosecution lingers for her, too. Baron's statement on Monday said that Rezaian "and his wife, Yeganeh Salehi, who has been out on bail, should both be granted, without delay, the full freedom that is their right." Journalists around the world have joined The Post in that demand. Dean Baquet, the executive editor of The New York Times, said on CNN Sunday that "Jason was just doing his job, and it's an outrage that we're even at this point." Edward Snowden, the NSA whistleblower who is in exile in Russia, added his voice on Monday, using his new Twitter account to say, "It is unconscionable for courts to convict journalists behind closed doors. Iranian leaders bear an obligation to correct this injustice."